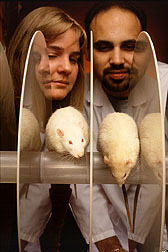 To determine the motor function of middle-aged test rats, behavioral psychologist Barbara Shukitt-Hale and technician George Mouzakis monitor the performance of these 15-month-olds walking a rotating rod. Studies at the Jean Mayer USDA Human Nutrition Research Center on Aging at Tufts University in Boston suggest that consuming fruits and vegetables with a high-ORAC value may help slow the aging process in both body and brain. ORAC--short for Oxygen Radical Absorbance Capacity--measures the ability of foods, blood plasma, and just about any substance to subdue oxygen free radicals in the test tube. protected rats' tiny blood vessels—capillaries—against oxygen damage. These results have prompted Ronald L. Prior to suggest that "the ORAC measure may help define the dietary conditions needed to prevent tissue damage." Prior is coordinating this research with Guohua (Howard) Cao, James Joseph, and Barbara Shukitt-Hale at the Boston center. Science has long held that damage by oxygen free radicals is behind many of the maladies that come with aging, including cardiovascular disease and cancer. There's firm evidence that a high intake of fruits and vegetables reduces risk of cancer and that a low intake raises risk. And recent evidence suggests that diminished brain function associated with aging and disorders such as Alzheimer's and Parkinson's diseases may be due to increased vulnerability to free radicals, says Joseph, a neuroscientist. Such evidence has spurred skyrocketing sales of antioxidant vitamin supplements in recent years. But several large trials testing individual antioxidant vitamins have had mixed results. "It may be that combinations of nutrients found in foods have greater protective effects than each nutrient taken alone," says Cao, a chemist and medical doctor. 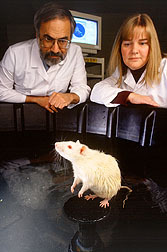 Neuroscientist Jim Joseph and behavioral psychologist Barbara Shukitt-Hale estimate the memory capacity of test rats required to swim to a submerged platform in a pool. Software quantifies their performance by tracking swimming patterns. For example, foods contain more than 4,000 flavonoids. These constitute a major class of dietary antioxidants and appear to be responsible for a large part of the protective power of fruits and vegetables, Cao says. By the year 2050, nearly one-third of the U.S. population is expected to be over age 65. If further research supports these early findings, millions of aging people may be able to guard against diseases or dementia simply by adding high-ORAC foods to their diets. This could save much suffering, as well as reduce the staggering cost of treating and caring for the elderly. "The ORAC value covers all the antioxidants in foods," says Cao. "You cannot easily measure each antioxidant separately," he adds. "But you can use the ORAC assay to identify which phytonutrients are the important antioxidants." The researchers have been testing whether antioxidants other than vitamins are absorbed into the blood and protect the cells. And the results look promising. Several laboratories have reported that people can absorb individual flavonoids thought to have protective powers. Prior and Cao now have good evidence that food antioxidants not only are absorbed, they boost the antioxidant power of the blood. In an earlier study at the Boston center, 36 men and women ranging in age from 20 to 80 had doubled their fruit and vegetable intake. According to the participants' responses on a food frequency questionnaire, they averaged about five servings of fruits and vegetables daily during the year before the study. That intake was doubled to 10 servings of fruits and vegetables daily during the study. To estimate ORAC intakes for the participants, the two researchers matched the questionnaire and the diet data with their own antioxidant values for each fruit and vegetable. Before the study, says Prior, the participants averaged 1,670 ORAC units daily. Increasing their fruit and vegetable intake to 10 a day raised the ORAC intake to between 3,300 and 3,500 ORAC units—or about twice the previous antioxidant capacity. Based on the participants' blood samples, the antioxidants were absorbed. The ORAC value of blood plasma increased between 13 and 15 percent on the experimental diet. This supports results of a preliminary study in which Prior and Cao saw a 10- to 25-percent rise in serum ORAC after eight women ate test meals containing high-ORAC foods, red wine, or vitamin C. They tested red wine because it has a high ORAC value—higher than white wine—and has been associated with a lower risk of cardiovascular disease. Ten ounces of fresh spinach produced the biggest rise in the women's blood antioxidant scores—even greater than was caused by 1,250 milligrams of vitamin C. An 8-ounce serving of strawberries was less effective than vitamin C but a little more effective than 9.6 ounces of red wine. Prior says the increase in plasma ORAC can't be fully explained by increases in plasma levels of vitamin C, vitamin E, or carotenoids, so the body must be absorbing other components in these fruits and vegetables. The antioxidant capacity of the blood seems to be tightly regulated, he says. Still, "a significant increase of 15 to 20 percent is possible by increasing consumption of fruits and vegetables, particularly those high in antioxidant capacity." The ORAC values of fruits and vegetables cover such a broad range, he adds, "you can pick seven with low values and get only about 1,300 ORAC units. Or, you can eat seven with high values and reach 6,000 ORAC units or more. One cup of blueberries alone supplies 3,200 ORAC units." 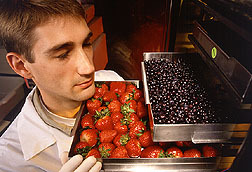 Fruits with high oxygen radical absorbance capacity are freeze-dried by technician John McEwen for feeding in experimental fat diets. Based on the evidence so far, Prior and Cao suggest that daily intake be increased to between 3,000 and 5,000 ORAC units to have a significant impact on plasma and tissue antioxidant capacity. Rat studies are yielding even more support for high-ORAC diets. The animals live only about 2 1/2 years total, so it's possible to follow the effects of high-ORAC foods on the aging process. Joseph and Shukitt-Hale have been testing extracts of strawberry and spinach, along with vitamin E, in the rodents. And some of their results wouldn't surprise Popeye. A daily dose of spinach extract prevented some loss of long-term memory and learning ability normally experienced by middle-aged rats. And spinach was the most potent in protecting different types of nerve cells in various parts of the brain against the effects of aging. The researchers started 6-month-old rats on four feeding regimens. Two groups got diets fortified with either strawberry or spinach extract, one ate the diet containing an extra 500 international units of vitamin E, while a fourth got the unfortified diet. Shukitt-Hale, a behavioral psychologist, had already put a group of rats through their paces to determine when they begin to falter in memory and motor function. She says the animals start to lose motor function around 12 months and memory at 15 months; the latter is equivalent to a 45- to 50-year-old human. When the study rats reached 15 months, she had them doing gymnastics—such as walking on rods and planks and trying to stay upright on a rotating rod—all tests of motor function. She also had these excellent swimmers paddle around a deep pool until, using visual cues, they found a submerged platform on which they could rest. With this test, she measures changes in long- and short-term memory. "None of the diets prevented motor loss," says Shukitt-Hale. The 15-month-old rats performed like middle-aged animals whether they got the extra antioxidants or not. But the spinach-fed rats had significantly better long-term memory than the animals getting the control diet or the strawberry-fortified diet. They remembered how to find the hidden platform better over time, she says, showing they retained more of their learning ability. The vitamin E-fed rats were somewhat less protected against memory loss than the spinach group. "That's significant," she notes. "It's really difficult to effect a change in behavior." Joseph looks for age-related changes in brain cell function, focusing on an area of the brain that controls both motor and cognitive function—the neostriatum. As people and animals age, the cells become sluggish in responding to chemical stimulation, he says. For 15-month-old rats, the striatal cells have lost 40 percent of their ability to respond to such signals. To better understand cellular activity within the brain, technician Derek Fisher views fluorescent images of calcium in cells that are affected by oxidative stress. 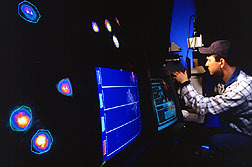 The calcium binds to a fluorescent dye that the imaging system can measure. Not so in the animals whose diets were fortified with spinach or strawberry extracts or vitamin E. Their striatal cells performed significantly better than those of rats on the control diet—especially the rats getting the spinach extract. That group scored twice as high as the control animals in Joseph's test. The spinach group also scored best among the fortified diets in a test of nerve cells in the cerebellum, a part of the brain that maintains balance and coordination. The test was done by Paula Bickford, a collaborating pharmacologist with the University of Colorado Health Sciences Center in Denver. Why spinach is more effective than strawberries is still a mystery. The researchers conjecture that it may be due to specific phytonutrients or a specific combination of them in the greens. While this research is still in its infancy, says Joseph, "the findings, so far, suggest that nutritional intervention with fruits and vegetables may play an important role in preventing the long-term effects of oxidative stress on brain function." Prior and Cao also have early evidence that these foods protect other tissues. Subjecting rats to pure oxygen for 2 days normally damages cells lining the tiniest blood vessels, or capillaries, causing them to become leaky. As a result, fluid accumulates in the rats' pleural cavity—the space surrounding the lungs. But that was minimized when the animals were fed blueberry extract for 6 weeks before the oxygen stress. Of all the fruits and vegetables tested with ORAC, blueberries are one of highest in antioxidant capacity. In human terms, says Prior, the animals got the equivalent of 3,000 ORAC units. "If we can show some relationship between ORAC intake and health outcome in people, I think we may reach a point where the ORAC value will become a new standard for good antioxidant protection." —By Judy McBride, Agricultural Research Service Information Staff. This research is part of Human Nutrition Requirements, Food Composition, and Intake, an ARS National Program described on at http://www.nps.ar s.usda.gov/programs/107s2.htm. Ronald L. Prior, James A. Joseph, Guohua Cao, and Barbara Shukitt-Hale are at the USDA-ARS Human Nutrition Research Center on Aging at Tufts University, 711 Washington St., Boston, MA 02111; phone (617) 556-3310, fax (617) 556-3299. "Can Foods Forestall Aging?" was published in the February 1999 issue of Agricultural Research magazine.